If you are learning traditional Chinese, you must have heard about Bopomofo, also called Zhuyin. The phonetic system consists of 37 symbols and 5 tone marks which compose all possible pronunciations in Mandarin Chinese. Unlike the pronunciation of those who use Hanyu Pinyin, those who learn Bopomofo are less likely to be interfered by alphabetical first languages. Does every story contains Bopomofo? No, Bopomofo is only for the Chinese starter. Not every story contains Bopomofo. The following is our app that will help you to learn and practice Bopomofo. This is a Bopomofo electronic learning book with a total of 37 pages (37 phonetic symbols), and there are 4 vocabulary for each symbol to help learners familiarize different combinations of the symbols. In addition, the symbol hunting game is not only fun to play, but it also trains the recognizing ability of learners. 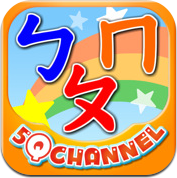 You may also find the same Bopomofo content on our website, 5QChannel.com, here is the link. Free trial please click here. How can I find the story contains Bopomofo?